PureLeef is a company committed to health and body image improvement. We offer women natural products to help safely enhance or slim their bodies while keeping the curves they desire. Cleansing is important, but the right facial cleanser does much more than simply wash away dirt, oil, and makeup. Using a cleanser formulated with high-end ingredients can visibly improve existing concerns, for skin that is smoothed, soothed, and glowing! 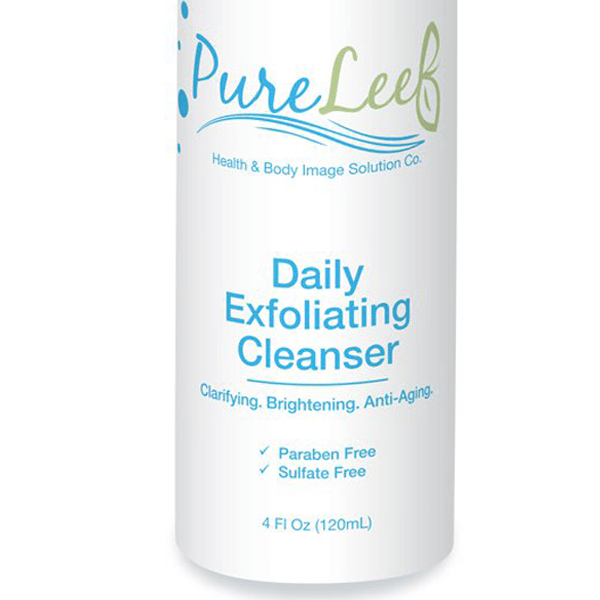 PureLeef Daily Exfoliating Cleanser uses 2% Glycolic Acid to buff away dead skin cells and reveal the fresh, baby soft skin beneath. Glycolic acid works by dissolving the glue that holds old skin cells to our face, which otherwise result in a dull, lifeless complexion. This unique formulation includes Peptides to smooth and soften the appearance of fine lines, as well as Grapefruit to brighten and even skin tone, for a brighter and even toned look. Chamomile and Aloe nourish and protect the newly revealed skin cells, calming redness and providing a layer of hydration for truly perfect skin! Application: For best results, use nightly. Recommended for use on all skin types. Directions: With damp hands, apply a small amount to dry skin. Gently massage using circular motions avoiding the eye area. Rinse and pat dry. PLEASE READ: This product works by bringing out all impurities and bacteria in the skin, exfoliating dead skin cells and recreating refined, new, glowing skin. Therefore it is possible to have some minimum breakout and light peeling to occur within the first 2 weeks of use. This is a positive effect of the product to generate new skin cells. If extreme irritation or redness occurs, minimize use to every other day or discontinue use completely.